almost becomes part of the body. Medpore is non toxic and inert and is used in many other implants around the facial region. The framework is covered with a thin covering of tissue known as “fascia” that is harvested from beneath the hairbearing scalp, thus a scar is left within the hairbearing region. This fascia is turned down to cover the Medpore framework completely. 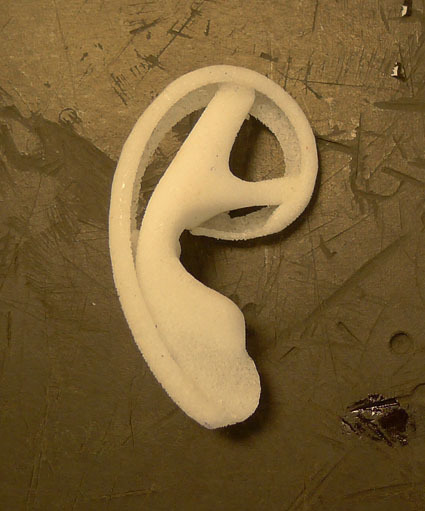 The remnant of the ear is used to make the earlobe. A skin graft is taken from the scalp and placed over the fascia. A suction dressing is applied and a head bandage. The graft is checked after several days and the drain removed, at which time it is possible to be discharged. Several dressing changes will be required on an outpatient basis for the next two to three weeks. Once the graft no longer requires dressings it can be left uncovered and allowed to mature. 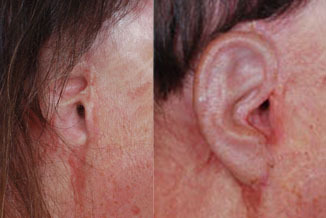 The ear will initially look very swollen and unappealing but over weeks will shrink and the detail will begin to appear. The skin graft will eventually smooth out. Sometimes it becomes slightly paler than the surrounding area over time. Scalp skin is used to try and get the best colour match. Although complications of poor blood supply and infection are possible the risk is a little less than with a cartilage ear. The ear can look very good but perhaps not as good as the best cartilage ear. Medpore is not as resilient to trauma as cartilage and contact sports should be discouraged as it is possible to fracture the framework.